Titus appears as a young, short boy in the Magnostadt arc. He has medium long blonde hair with two small, thin braids. 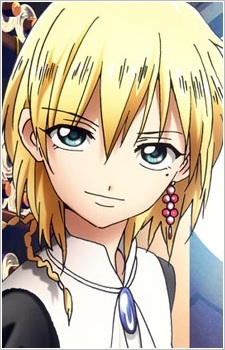 His appearance is amazingly similar to that of the Magi, Scheherazade; for his parted fringe hairstyle, the shape of his eyes, the mole under his left eye and his earring on his left ear, which resembles grapes, are similar the headpiece Scheherazade wears. He wears a loose sleeved, high open collared shirt with a cravat, and loose shorts with a front open slit and buttonable hems under his magician's robes. His cravat has an oval jewel embedded in it, and he wears knee high, fold over boots. He was mistaken for a girl by Aladdin because of his high voice and his big bottom. Titus is actually a clone of Scheherazade, and sacrifices himself in order to save Magnostead. He later on is resurrected by Ugo and becomes the third Magi after Scheherazade dies.